Immersed in the breathtaking rural setting of The Roseland Peninsula, a warm welcome awaits at The Cowshed. 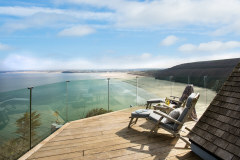 This unique and indulgent hideaway offers a truly luxury home-from-home ambiance for up to 8 guests to relax and enjoy some Cornish zen. 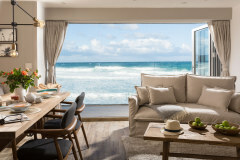 Far reaching views of the blue seas and picture perfect coastline offer the idyllic backdrop to your time out by-the-sea, whilst the stylish interiors and considered layout set the scene in all seasons. 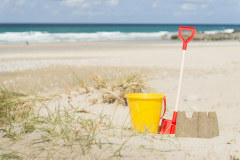 As perfect for a winter weekend as a lazy summer week, discover The Cowshed and this very special corner of Cornwall. 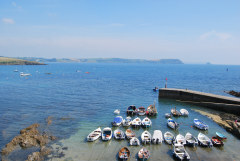 Portscatho and St Mawes are moments away offering a cool collection of places to eat, drink and explore. Once a former 1930's farm building, The Cowshed has been flawlessly converted to create the super-stylish holiday home found today. The welcoming entrance leads into a large light filled open plan living area with lofty ceiling and relaxing ambiance. The unique layout of the barn has been cleverly crafted to maximise the sense of space yet create separate areas for holiday life. The living space really is the hub to the barn with oversized corner sofa and state of the art technology from the Airplay wireless music options to the large wall mounted TV with SKY. This versatile space is perfect for cosy evenings catching up by the fire or for relaxed mornings planning the days exploration. A stylish glass and polished steel staircase leads down a level to the enviable dining room and kitchen. This fully fitted designer kitchen is perfect for holiday cooking from fine dining celebratory occasions or simply a casual brunch, every dish, pan and pot have been carefully choosen. The chic white dining table offers ample space and seating for 10 guests set under the sunny window. From the living room the hallway leads with level access to three beautiful bedrooms each individually styled and worthy of any boutique hotel, sink under luxury linens at the days end. The fourth bedroom is found on the mezzanine level above the living room, this zip & lock bedroom offers wonderful views of the sea and offers a lofty space with large wall mounted TV and SKY channels. The collection of contemporary bathrooms are no less considered from the handmade jade green wash basin to the indulgent Trevarno toiletries, de-sand and de-salt in style after a day on the coast. The whole barn has been thoughtfully decorated in a fusion of cool white and blue hues with the colour of the local artwork adding warmth and personal character. Lead into the spacious garden and enjoy the tranquility of the rural setting. To the front of The Cowshed is a large paved area leading to raised suntrap area with sun-loungers and breathtaking views across the fields and down to the sea and Percuil River that flanks the coastal town of St Mawes, what a view! At the gable end of the barn is a bespoke seating area (perfect for a sundowner) with all weather corner sofa and coffee table and also a larger dining table where up to 10 guests can choose to dine al fresco as the sun sets over the fields. To the front of The Cowshed a gate leads through into a communal verdant green field offering ample space for children to play safely or even a family tournament of croquet perhaps? 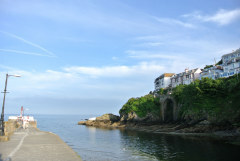 If you are new to The Roseland Peninsula then enjoy the relaxed pace, quieter shores and nautical influence of this wonderful part of South Cornwall. St Mawes is a wonderful place to visit offering a boutique collection of artisan cafes and restaurants alongside the more traditional pubs. The beautiful Carrick Roads attracts yachts from all over the world who are drawn to the safe sailing waters and sheltered inlets of the area including St Just in Roseland and Mylor. 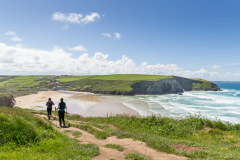 If a day at the beach is on the cards then a number of sandy coves are all within a short drive of your holiday door including Porthcurnick, Pendower, Carne and Towan. 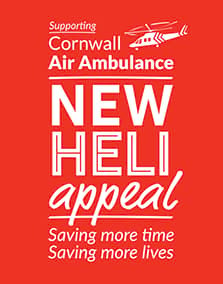 1/2 mile down the road from Th Cowshed is Percuil, a charming spot full of boat yard life, in the summer the sailing school offers tution or, for those looking for adventure then take to the water and explore the creeks by kayak or head to the horizon with a Cornish cruise. 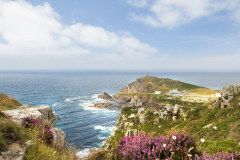 Day trips to the contrast of North Cornwall are an easy option or head further west taking in the rugged cliffs and legend of Land's End. 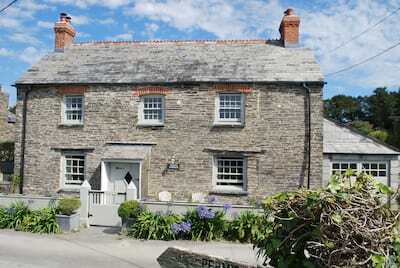 The Roseland offers a plethora of delicious places to enjoy the very best Cornish food. The Hidden Hut on Porthcurnick Beach is firmly on the guide maps and well worth a visit, walk from The Cowshed in approx 20 minutes and sit overlooking the sea enjoying the freshest food all whipped up in the hut. Tatums coffee house in Portscatho has to have the best view in the area. The plume of feathers is in the centre of the village and is also a very good pub. The boathouse restaurant offers hearty breakfasts and home cooked meals. Fine dining is available at The Driftwood, Rosevine or visit the Tresanton Hotel in St Mawes for jackpot views of the sea. 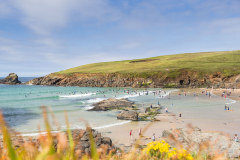 Why not try a new experience while in Cornwall? The Philleigh Way Cookery School nearby offers wonderful courses from Better BBQ-ing to Simply Fish. Coffee lovers will adore the barista skills of Tatums on the quay at Portscatho, all within walking distance from your holiday door. For larger groups of up to 10 then choose to take The Dairy in addition to The Cowshed offering a further bolthole just-for-two. Each bathroom has been individually styled to create a unique sense of indulgence. A enviable modern fully fitted kitchen for all your holiday cooking! The owners of The Cowshed live within the neighbouring house. The Cowshed remains private with exclusive use of the garden.The property changeovers, welcome gift and maintenance are managed by the property owner. 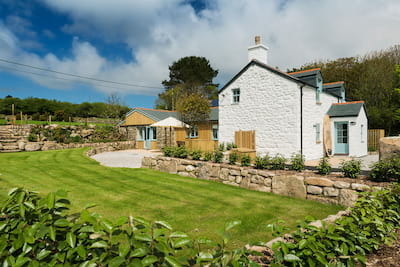 The Cowshed is a spectacular holiday home. Set in a beautiful location, it offered everything we needed to make our holiday perfect. Thank you for a lovely stay at The Cowshed. We had an amazing time at The Cowshed. What an amazing House. The Cowshed felt like home. A lovely peaceful holiday with the family. What a gem of a find. Every need was anticipated. The views are perfect. We would recommend The Cowshed to all our friends and family a home from home, very comfortable. A fabulous House for friends and family to enjoy. Thank you for all the details in the cottage. Beautiful cottage and great location. A fabulous place to stay, every detail is catered for. Stunning Views. Excellent accommodation for us all. 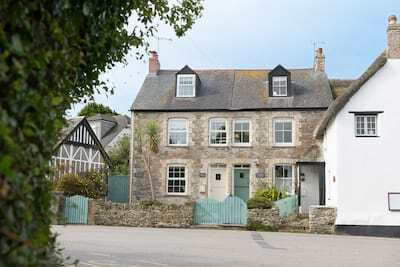 A lovely holiday house, fabulous location and very well equipped. The Cowshed was perfect as usual.We will be back. Lovely property with beautiful view. Excellent house in a beautiful location. The house was very clean and well equipped. We would love to go back to this house in the future. The Cowshed is a first class property. A holiday home with the emphasis on "home". Beautiful location, lovely property, friendly owners. Very good experience both with Cornish Gems and The Cowshed.